!! जय जय श्री जुगल किशोर जी !! Diya Dasi, Himanshu Dev Banga, Jyothi Jasmine Ranjan and 6 others like this. 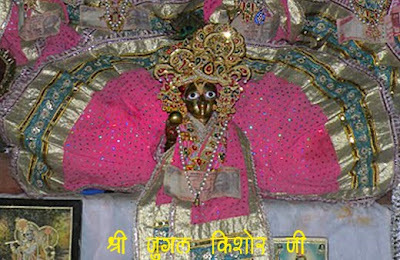 Shri Jugal Kishore Ji of Shri Dham Vrindavan always resides here....To Know more about His temple History One can click on the link given below..
Lord shri Krishna in his great Love, accepts anyone who come to him now we need your blessing to feel the same as you do. Plz bless us!! All glory goes to Shri Shyamsundara, Shri Jugal Kisora..Shri Krishna...Only He is Saksham to blessed us with His Eternal Bhakti towards His lotus Feet...So Lets us Pray to Him with folded hand..
O Krishna....O Krishna...... I know, You are now with me, yet I am unable to see you. Grant me Grace, empower me to behold You..... You are my Light. You are my Father. You are my eternal Mother.... You are the Breath of my breath. You are everything. From all sides, at all times, You are watching me, seeing me, blessing me.... You are in the children, in the creatures great andsmall.... You are everywhere." "O Krishna.....O Krishna....Lead me, guide me, purify me, render me peaceful, wise, strong, noble, saintly. As You are in me, express Yourself through me. Let me be a channel for the flow of Your Nature and Qualities.... Not my personality, but Your Personality which is full of Perfection, finds Its expression through me.... I don’t want my will to be done, for my will is imperfect, exposed to wrong impulse, full of limitations. Thy Will is wonderful, perfect, omnipotent. Let Thy Will be done through me...."
"O Krishna...O Krishna....My intelligence makes many mistakes. What it thinks to be the right thing is often to be not so.... Let Thy Intelligence which is omniscient guide my intelligence along the right and fruitful lines.... My heart is limited in its love; sometimes I love people who are beneficial to me, and cease loving them when they no more serve my interests. Let Thy Love which is unconditioned rule my heart.... My best plans to protect my interests are not free from unforeseen difficulties. Anything can easily burden me with cares and worries.... Let Thy Wisdom, Thy Light, Thy Care, Thy Grace, conduct my life and preserve me in the experience of Thy Peace, Thy Power, Thy Happiness." !! Sadar Charanparsh Anil Jee !! May "HE" will Bless you too..